I have found that the accordion MIDI cable supplied as part of a MusicTech system is not very robust. After a while it starts to malfunction. Sometimes notes stay on longer than they should and sometimes the whole thing just stops working. I have found that there is virtually no information available about how to repair these cables so I have taken it upon myself to provide some. NOTE; If you mess with the cables on your accordion you may cause serious damage to the electronics of the accordion and the MIDI equipment. This information is provided for you to use at your own risk! So, my accordion MIDI equipment used with a Q-Link system is shown on the right. Your equipment might not include the MIDI volume control. In general, the other cables are quite robust. 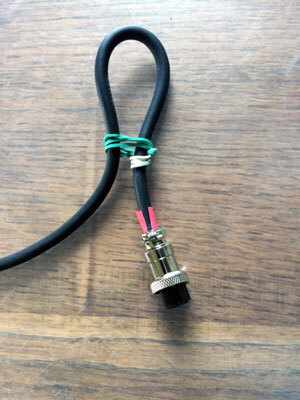 The MIDI expander cable will eventually break but they are easy to buy at any music store. The accordion MIDI cable is usually at least 1.5 m long with what are often described as DIN connectors at each end. 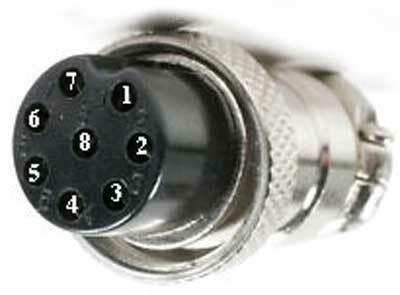 At the accordion end we have an 8-pin, female plug also known as a Ham Microphone Plug with the socket holes labelled as shown on the left. This is carefully designed to screw into the base of the accordion in just the right place so that, when you stand up at the end of a long evening to accept your rapturous applause, you stand on the cable and tear it out of your accordion, thereby concluding the day on a bit of a downer. For some advice on this problem, please see further down. 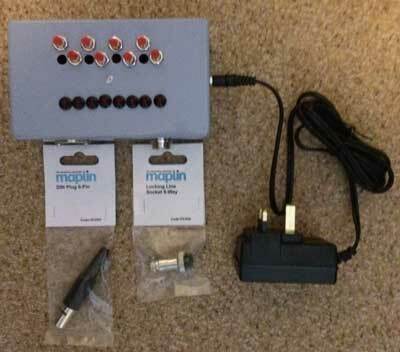 Examples of where to buy this connector include Maplin in the UK (go to page >>) and RadioShack in the US (go to page >>). At the other end of the cable is a 6-pin male DIN plug (sometimes you have to specify that it is a 270° plug). You can buy this at Maplin in the UK (go to page >>) or at Digi-Key in the US (go to page >>). 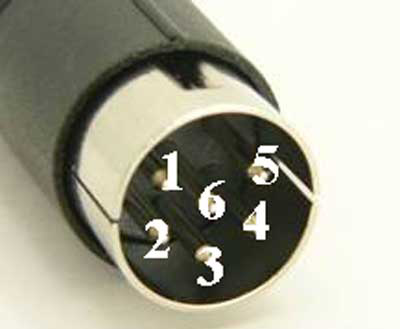 This has its pins arranged so that the plug will not go into a standard MIDI socket. Quite often it will not go into the MIDI power supply box without a lot of pushing, either. So, you may ask, why are there 8 pins at one end of the cable and only 6 pins at the other? *Chris Leach from the US, who has a Music Maker (built in sound card) system, got in touch to say that when he had to replace the 8-pin socket he found a green wire attached to pin 5. This made me look at other cables to find that usually this goes to the 6-pin plug, pin 3. My system is a Q-Link and does not have the green wire so I have referred to it in the wiring diagram as optional. For the avoidance of doubt, I would make this connection in case it is required for some reason. Here is a connection diagram looking at the internals of the connectors exactly as you would when you solder the wires. You can get a printable version of this diagram by clicking on the picture (Adobe Reader required). You might find that it is quite tricky to solder the various leads onto the connectors. 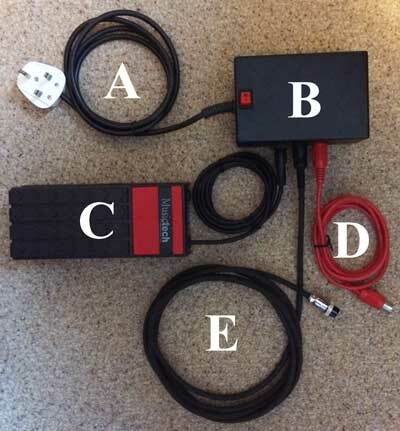 To help I have made myself an Accordion MIDI Cable Tester as shown below. This allows me to check the cable continuity. By pressing each of the red buttons in turn, I light up the LEDs below in the order 1, 2, 4, 5 and 8. If any other LED lights up then I know that there is a wiring problem. This is also useful when the MIDI system starts to act up as it sometimes does if the cable is getting old. By pushing all of the buttons at the same time and then wobbling the cable, I can see if there is an intermittent connection, indicated by a flash from one or more of the LEDs. On the subject of standing up with your foot on the MIDI cable and doing it some damage, Simon Mack suggested the use of a sprung kink in the cable just below where it goes into the accordion. This uses a captive rubber band (the green one) which gives you just a bit of a reminder that the cable is there as you stand up with the other rubber band stopping it from flying off when operated. He also noted the less-engineered solution which is to loop the cable through your belt or other suitable part of your clothing so that it releases in time for you to be reminded of its presence.